Cabernet Sauvignon by Reillys of Clare Valley. Generously flavoured palate juicy fruits, logan and mulberry over a carriage of fine grained tannins, framed by a judicious trim of smooth cedary vanilla oak. Valley Clare yields a distinct style of Cabernet Sauvignon, characterized by sweet dark berry flavours, regional mintyness and rolling velvet tannins. The finish resolves on a swirl of lingering minty dark chocolate notes, brambles and mint. In 1993, Reillys started from humble beginnings where the first vintages of wines were processed on the front porch of the Cottage. What started as a passionate hobby for Chief Winemaker Justin Ardill soon became a thriving business due to his commitment to consistently produce premium quality wines. The winery has steadily grown over the years, quickly outstripping the capacity of the cottage, and production was moved to a state-of-the-art facility in nearby Leasingham in 2000. The Clare Valley is famed for its Rieslings, Shiraz and Cabernets - what differentiates the Clare from many other Australian wine regions are the dry, hot summer days and cool, crisp nights which contribute to the intensity of the flavours in Clare Valley fruit. Reillys vineyards, located in the Leasingham and Watervale subregions of the Clare Valley are non-irrigated, depending solely on rainfall. They yield limited quantities of small, delicious berries which are hand picked to ensure only the premium fruit is selected to go into our winemaking process. The Reilly's Wines philosophy is to produce low volumes of premium, hand-made wines from this unique fruit. Reillys wines are very enjoyable in their early years and will richly reward those with patience, showing their best with 5-10 years maturation in the bottle. The fruit is crushed at the Leasingham facility and fermented in open vats, prolonging contact of skins and juice. The fermented wine is then basket-pressed. This is a slow process providing last pressings which contribute to creating fine wines of intense colour and flavour. Reillys red wines are then stored in new, premium quality French and American oak hogsheads for one to two years. Reilly's Cottage is now the winery's Cellar Door where visitors can sample crisp, clean Rieslings and big, bold reds. Adjacent to the cellar door tasting area, there is Reilly's Restaurant serving Northern Italian influenced cuisine. 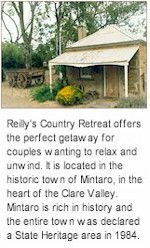 Reilly's also offer accommodation at Reilly's Country Retreat, just behind the cellar door. Reillys wines have won many awards, including trophies and gold, silver and bronze medals at major wine shows. Reillys have also received critical acclaim from prominent wine writers and publications including James Halliday, Jeremy Oliver, Robert Parker and Winestate.